Being able to represent data in a clear, concise, and engaging way is an essential skill. While an effective poster is key, data visualizations are a tool that enhance the communication of narratives underlying the data. 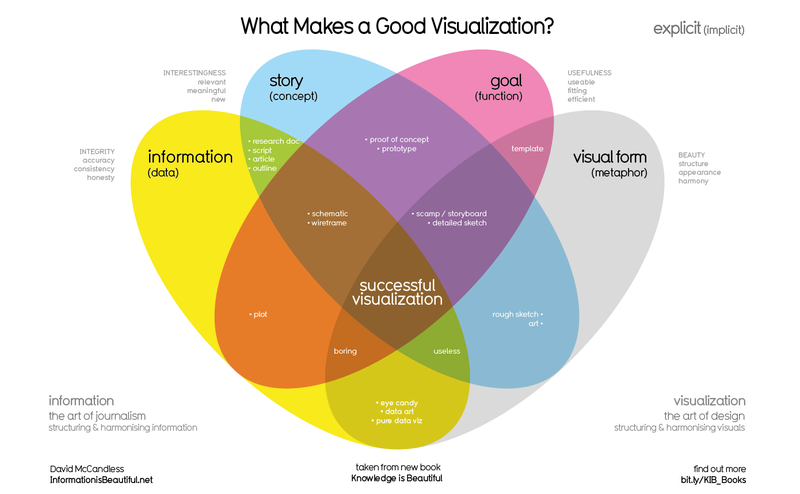 David McCandless, a world-renown data visualization maker and creator of Information is Beautiful, constructed a Venn diagram that depicts the essential elements of a successful data visualization. The irony of this data visualization, which aims at serving as an aesthetically-pleasing vehicle for what comprises a good visualization, is that there are several elements that don’t make it a successful one. Firstly, the information he wants to communicate is not immediately obvious. Figuring out how each of the circle categories and their intersections relate to the associated examples (e.g. information x goal = plot) takes time and is distracting. In addition, some of the examples he gives aren’t very descriptive. What does he mean by “pure data viz” in the visual form x information intersection? What about “proof of concept” at the intersection of goal and story? There isn’t enough context available to make sense of these examples and categories. While the visualization is accessible to colorblind audiences (a very important element to a good data visualization), the point that McCandless wants to communicate is lost due to its lack of description and over-complicated use of the Venn diagram model.